Jerusalem with its Old City, religious places and famous markets has long been the centre of Palestinian life on artistic, intellectual and business and political levels. Palestine has been under occupation for hundreds of years (Ottomans, British and Israelis) and has not had control of its country but certainly Jerusalem is for Palestinians the heart of the country and they want it to formally become their capital. Jerusalem is holy to Muslims, Christns and Jews and has over centuries been shared or fought over. In the past century, the Israelis have been pushing to take it over completely and restricting the freedoms of the Palestinian population (both Muslim and Christian) and making it difficult for them to live and remain there. When the UN made a suggested division of Palestine in 1947, the international importance of this area to people of the world, to Muslims, Christians and Jews was recognised by the proposal of an internationally-controlled area of 70 sq km around Jerusalem (this would have included Abu Dis, Bethlehem and Ramallah) – though this never happened. In 1948, the Jewish forces took over the western part of the city. The takeover of the city and its surrounding villages involved massacres (most famously that of Deir Yassin) and the forced evacuation of thirty-two villages by armed forces. This west side of Jerusalem was then declared as part of Israel. Thousands of refugees fled to nearby areas now in the West Bank or to further away. Some villages were razed to the ground, others stood empty, and others still were taken over. The homes and property of Palestinians in the west of Jerusalem was taken over; some taken by and some redistributed to Israeli individuals and institutions. This is well remembered by Palestinians in diaspora and often written about and represented as Jerusalem was the home of business people, artists and intellectuals. Judaisation refers to the attempt to replace a previously Palestinian (Muslim/ Christian) area with a Jewish area in housing, culture and control. Israel has put in place a series of measures to join Jerusalem to Israel, separate it from the West Bank, house in it Jewish Israelis and push the Palestinian residents into smaller spaces and sometimes into exile. Israelis have taken over areas in and around East Jerusalem for Israeli settlements that are not available to Palestinians, connecting them with a transport infrastructure to bind them closely into West Jerusalem (new tram, and new trains planned) . Inside the city, they have taken over house by house, sometimes through horrible stories of violence and pressure on people to sell or to leave homes, and sometimes through legal action declaring that homes had in the past some Jewish connection so that current inhabitants should leave. The number of Jewish people in East Jerusalem has risen to over 205,000 (in contrast to scarcely any in 1967) whereas the Palestinians in the same area are now 160,000 (in contrast to 380,000 in around 2000 before the Separation Wall was built). The Old City is full of Israeli flags, showing the settlers’ homes. In the areas around the old city – Sheikh Jarrah, Silwan, it is shocking to find people living in tents near their houses while settlers have moved into the house itself. Arabic names of roads have changed to Hebrew; names of villages have given way to settlement names. Blue and green IDs – In the 1967 war, Israel took over the rest of Jerusalem as well as the West Bank, Gaza, Sinai and the Golan Heights. Immediately, they annexed East Jerusalem to Israel, but they did not take the Palestinian people there as Israeli citizens. The Palestinian ‘residents’ have no vote in Israeli elections and cannot get Israeli passports except in exceptional circumstances. They can get a ‘laissez-passer’ which states that they are Jordanian citizens and they are treated in every way differently from the Israelis who have been progressively moving into their area. While Jewish people from the world over are encouraged to move in, Israeli is constantly holding over Palestinian residents the threat of losing their residency papers and being pushed out of the city. Palestinians from Jerusalem cannot bring spouses from outside the city to live with them in the city; if people are not in Jerusalem all the time they can lose the papers (that Israel calls ‘the right’) to live in the city. There are at this time of writing several hundred young people from Jerusalem who have not been given the blue ID and have become effectively stateless. Taxation with no representation – and poor services One of the tests of continual residence which helps people to safeguard their Jerusalem (blue) IDs is payment of the ‘arnona’ municipal tax. Palestinians find this difficult not only because of its expense (and economic inequality) but because Palestinian areas and people get very little service from this tax – poor rubbish/ cleaning services if any, very little money spent on schools. Palestinians are also aware of the contrast: the services provided in the areas where Israelis live and the financial help that the Israeli settlers are given to encourage them to live in the settlements of Jerusalem (as well as in the West Bank). House demolitions / expulsion of Palestinians While Jewish incomers are encouraged to build new homes, housing is a crisis for the Palestinians who will not be given permits to build homes in the city. Shockingly, demolitions of Palestinian houses by the Israeli military are frequent – and the pressure on Palestinians to leave the city is building. Barriers and pass system Israel has at once been linking the city to the settlements in the West Bank through great highways that only they can use – and cutting Jerusalem off from the Palestinians in the West Bank – most dramatically by the Separation Wall and military checkpoint. It is also through the divisions the Israelis have made between different groups of Palestinians, maintaining that there is a difference between Jerusalemites and West Bankers (even if they are from the same family), issuing different coloured passes, issuing or denying West Bankers “permits” so that they can go into the city. This is a city so it needs its hinterland, for workers and produce and to shop in its markets. It has become difficult and sometimes dangerous for West Bankers to bring their agricultural produce to the city as they need to come in through fierce checkpoints – It has become expensive, time-consuing (at big checkpoints in the early morning) and sometimes impossible for workers to come in. The operation of services in the city – such as hospitals – has had to change as their usual clients are only able to come in when allowed by the Israeli military. While West Bankers grieve at the difficulty of visiting their city, Jerusalemites complain about the isolation that they experience. Pressures on education The Israelis are doing little to support the education of Palestinians in the city – they have built no new schools and permitted the building of no new classrooms for Palestinians since 1967, and the crowded schools have poor or no access to playgrounds. They are also working on the Palestinian curriculum for Jerusalemites to cut them off from the West Bankers, censoring their school books and not allowing the Palestinian education authority a role. They will not recognise degrees given by the Al Quds University and they have forbidden the Al Quds Open University to operate within the city at all. Threats to Muslim and Christian holy places For Palestinians, this all seems like a plan going into place, step by step, push by push. Just as their important mosque in Hebron (Khalil) was partitioned following the shootings of Palestinians at prayer by the Zionist Baruch Goldstein in 1992, so now the possibility of losing the Al Aqsa is becoming real. Now members of the Knesset and Israeli radical parties are talking of ending the ‘athan’ (call to prayer) after hundreds of years; sometimes the mosque is shut when people want to pray. Newly, radical Israeli settlers have taken to entering the mosque to pray in it and they talk of taking over, partitioning or even destroying the old mosque which is very holy to Muslims. Christians are also upset by the Israeli disruption of pilgrimage routes that connect to the West Bank (Bethlehem, Bethany/ Aizariyeh). The Church of the Holy Sepulchre has also been complaining at Israeli plans for new, high taxes. 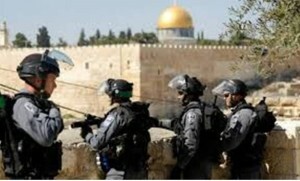 The tiny streets of the old city and the area around it are full of soldiers and armed settlers as well as the underlying tension described above. It is a dangerous place to be Palestinian and particularly a young boy; a large number of the shootings and killings in the past few years have taken place in the old city and its neighbourhoods. Trump’s US embassy move In May 2018, 70 years after the Palestinian Nakba, Trump (against protests from all over the world) took the controversial step of moving the US Embassy to Jerusalem, clearly accepting the Israeli claim on the city and ignoring the importance of the city to the Palestinians. This move will be remembered for the terrible slaughter that surrounded it – the protestors killed from the day that he announced it and in particular the slaughter of unarmed demonstrators in Gaza by Israeli snipers – well over 100 killed and thousands injured and disabled. Abu Dis cannot be a capital city! The threatened American peace plan, following hard on the heels of the embassy move, is rumoured to be proposing that the Palestinians should accept Abu Dis (Jerusalem suburbs) as their capital and give up their claim on Jerusalem itself. For Palestinians, that cannot be more than a sour joke or a trick: there is no way that the tiny town of Abu Dis, in no sense a city, could replace on any level the historic capital with its deep social, architectural and religious significance.